Many immunochemical methods use an indicator molecule attached to a pure antigen or antibody, such as an enzyme attached to an antibody. ELISA is useful for determining serum antibody concentrations; detecting and measuring antigens in a variety of tissues and samples; identifying hybridomas producing antigen-specific antibodies; and measuring idiotype-anti-idiotype interactions. Indirect ELISA: Our standard ELISA method used for screening hybridomas. Antigen is immobilized on to wells of 96-well plates and antibody-antigen binding detected using a secondary antibody conjugated to an enzyme and a chromogenic substrate. Capture ELISA: A secondary antibody (for example, goat anti-mouse) is used to capture murine antibodies. Avidin-peroxidase and a chromogenic substrate detect bound biotin-labeled antigen. 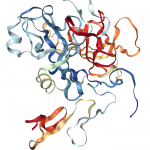 Competitive ELISA: Using a labeled protein antigen, single monoclonal antibodies are absorbed onto plastic wells and bind biotin-labeled protein antigen. Antigen-antibody complexes determined using avidin-peroxidase. Inhibition of biotin-protein by unlabeled protein forms the basis for a standard curve for protein quantitation. Solution-phase immunoassays: Useful for antigen-antibody interactions in solution and for quantifying soluble protein antigens. Directly measures free antibody in antigen-antibody mixture. Whole Cell: Cells are immobilized onto 96-well plates. Antibody binding to cell antigens detected using a secondary antibody and chromogenic substrate. For more information, and pricing for assay development, please contact us.